Bright and Breezy Crafts: It's definitely Autumn here! which sits on the border between our house and theirs, at the front. leaves for the past weeks. there was a sea of leaves that greeted us! We had to wade through them, to get to the cars on the drive! to pick *some* of the colours from that tree. I couldn't possibly find every colour. Lol. that I would have a chance to use a lot of colours. in Canada lat year, and haven't used yet. A couple of paper flowers, layered, finished this card. I haven't decided on the sentiment for this one yet. I can almost hear the wind blow on your pretty card Vic. Beautiful stamped and coloured image. Gorgeous card, I love the beautifully coloured image. Thanks for joining in the Crafty Calendar Challenge this month. Good luck! 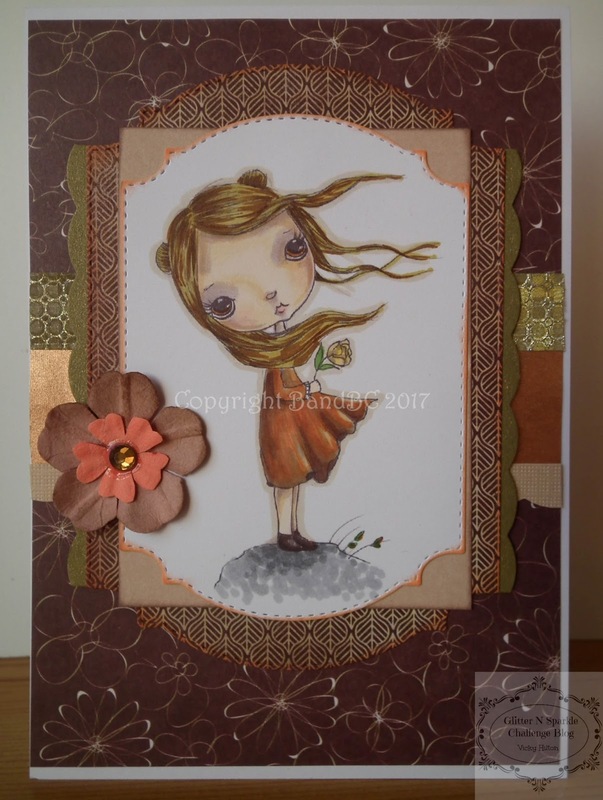 A beautiful card, thank you for sharing it with us at Crafty Calendar hope to see you again next time .